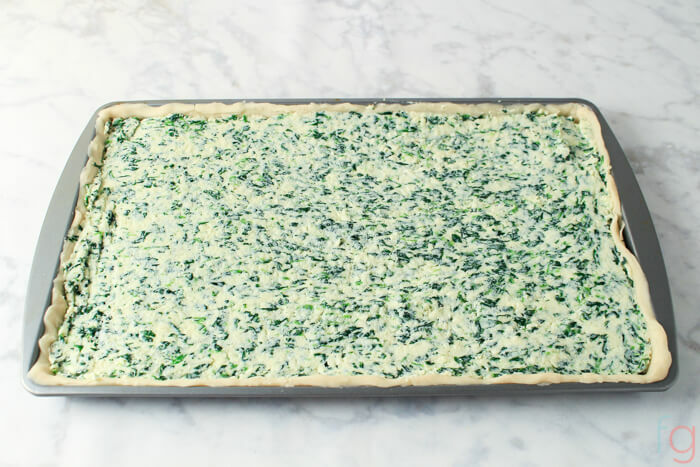 This Spinach and Ricotta Savory Slab Pie Recipe is a great easy appetizer for your party! 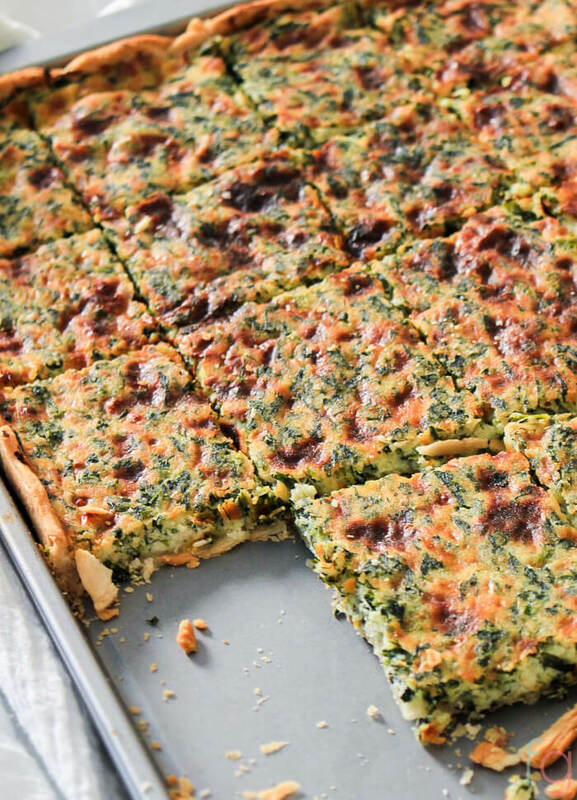 If you’re planning a Super Bowl party, this spinach and ricotta savory slab pie will fit right into your game day table. 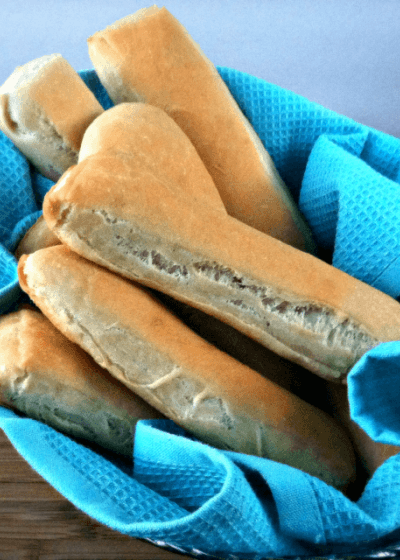 They’re rich, flaky, flavorful and are sure to be a crowd favorite! Before I get to the recipe, I wanted to share a few savings tips to help you make your party happen on a budget. 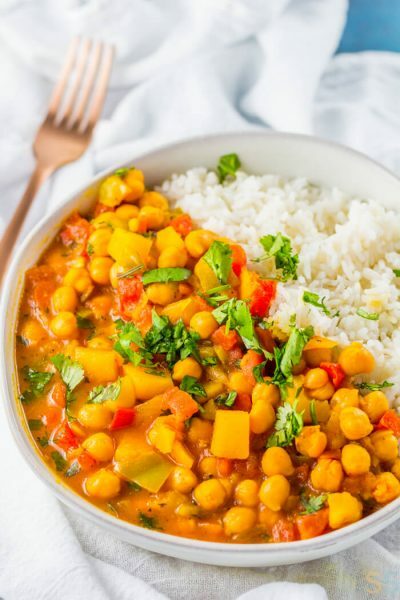 Limit Meat Dishes. 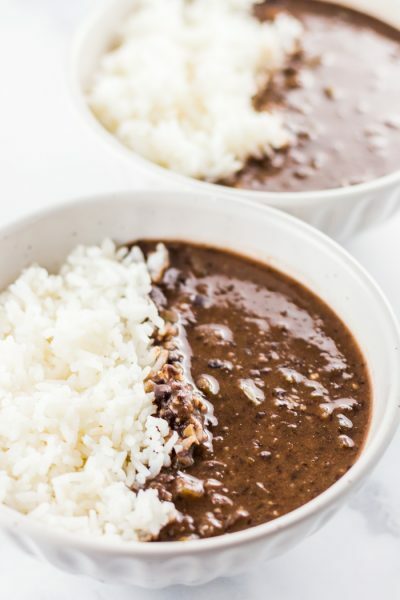 If you’re using meat in almost every dish, the price can add up fast! Keep meat to just one or two dishes and make meat simply an ingredient, rather than the star. So for example, think about serving a taco braid vs chicken wings. If you’re serving lots of people, this tip alone can be a big money saver! Create a Themed Bar. Themed food bars are an easy way to save on party food, and people tend to love them since they’re able to customize their plates. Taco bars and pasta bars are two popular ideas that come to mind. 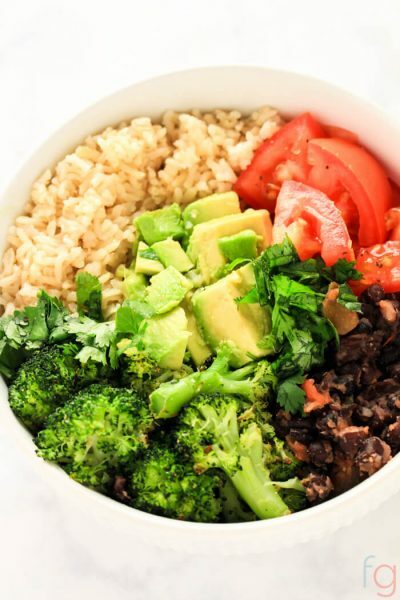 My vote is for a burrito bowl bar since burrito bowls are amazing, customizable and are super cheap to make. Shop Smart. Shopping at budget-conscious stores like Save-A-Lot and using coupons is a great way to save on your menu and disposable items you’ll need like paper plates. Starting 1/29/17 Save-A-Lot has a $5 off coupon so you can save even more if doing your shopping there! The coupon is only available at participating stores, so be sure to find the closest store near you and check your local ad to see if the coupon is available in your area. 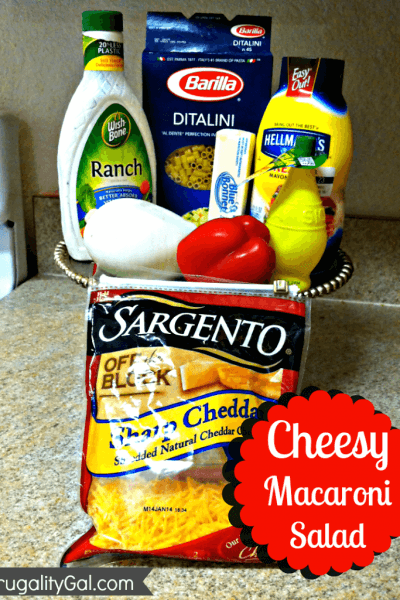 While you’re there, you should also check out their Smart Shopper Club to get frugal recipe ideas and deals. Have a Potluck. 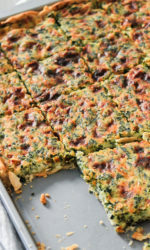 People love to share their favorite foods, so have your guests bring their favorite dishes to the party. There’ll be lots of variety and you get to save time and money in the kitchen. Use Printables. If you have a printer, scissors and a few minutes to spare, you can create cute Super Bowl decorations for free! With a quick search on Pinterest you’ll be able to find free printable files for things like food markers, cupcake toppers, bunting and more. Preheat oven to 425F. 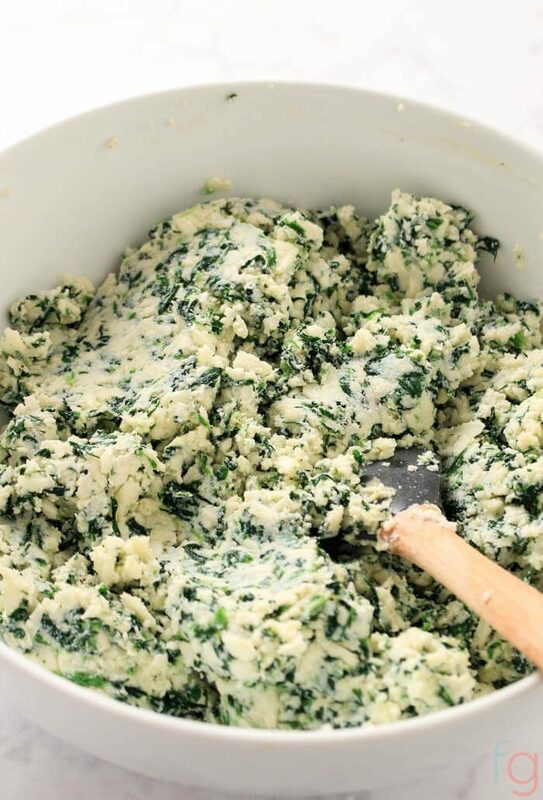 In a large bowl, mix all ingredients (aside from the pie crust) together. Mix thoroughly and set aside. 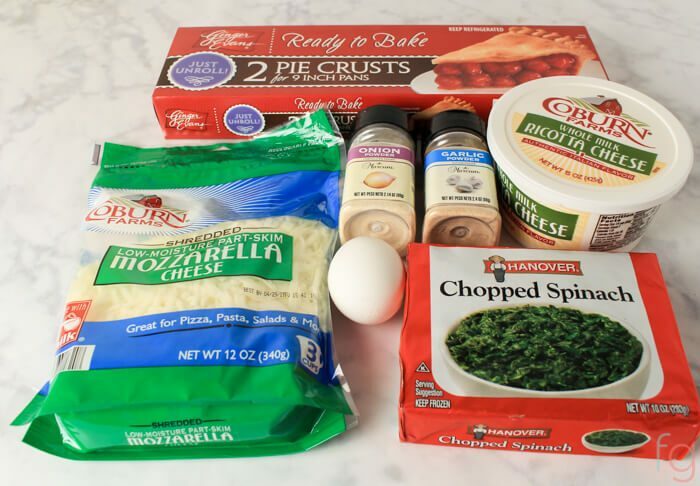 Roll out both pie crusts on an ungreased 10×15″ baking sheet (or similar size). Arrange both pieces of pie crust over the baking sheet so they’re covering as much area as possible. Then trim the excess and overhang and press the pieces into any bare areas. Continue doing this until you have one continuous pie crust covering the entire baking sheet, being sure to cover the inside lip. Press edges into the lip to create a somewhat uniform edge. Imperfections give it a nice rustic look, so it definitely doesn’t have to be perfect! 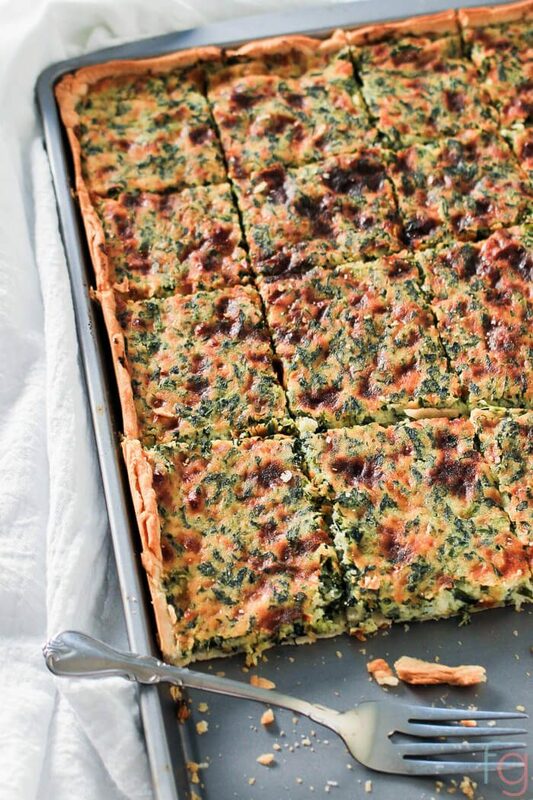 Spread spinach and cheese mixture evenly over crust. Leave a small lip at the top edges. Bake for 20 to 23 minutes in a 425F oven, until edges are golden brown. Remove from oven, cover with foil. Bake for additional 10 minutes. Once done, slice into 20 pieces and serve. 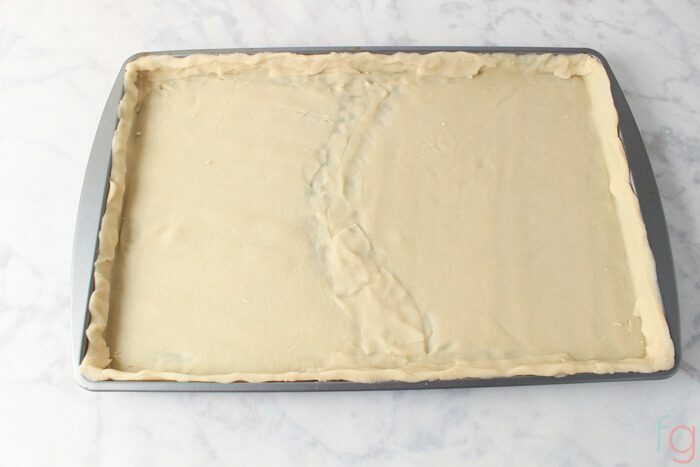 Roll out both pie crusts on an ungreased 10x15" baking sheet (or similar size). Arrange both pieces of pie crust over the baking sheet so they’re covering as much area as possible. Then trim the excess and overhang and press the pieces into any bare areas. Continue doing this until you have one continuous pie crust covering the entire baking sheet, being sure to cover the inside lip. Press edges into the lip to create a somewhat uniform edge. Bake for 20 to 23 minutes in a 425F oven, until edges are golden brown. Remove from oven, cover with foil. Bake for additional 10 minutes. Remove from oven, slice into 20 pieces and serve.